The amice is a liturgical garment that may be worn around the shoulders under the long white alb. It is a rectangular or oblong linen cloth worn lengthwise. 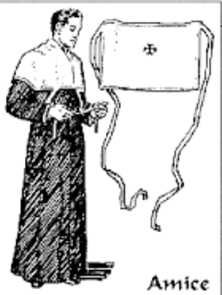 Two strings or tapes dangle from adjacent comers of the top, where a cross is sewn in the middle. 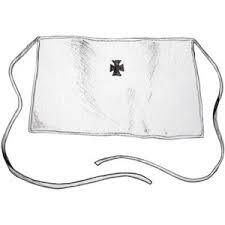 Not only the priest but the deacon and even the servers may wear the amice, alb and cincture (the belt that holds the alb in place). While vesting before Mass, the minister traditionally kisses the amice at the cross and then places it around the back of the head at the neck. The two long strings are crossed around the waist in front, in back and then in front again, where they are secured with a knot. The word is related to the Latin word amictus, meaning "wrapped." eighth century, it served as a neckpiece to cover street clothes and to protect other liturgical garments from sweat. In some places, it was tucked into place after putting on the alb, but that sequence eventually reversed. vestments. Then, the amice was dropped into place like a hood. priest was asked to say this prayer while donning the amice: "Place upon my head. Lord, the helmet of salvation, to fight off the devil's attacks." Today, if the alb itself covers clothing at the neck, an amice need not be worn.